Channel 4's entertainment channel, targeting a young audience. Its programming mainly consists of series, fictions and reality shows. Generalist channel. It is the UK’s main Free-to-air commercial public service broadcaster. Entertainment channel made especially for the male audience. Sports, films and serials. Cultural television channel by the BBC. Television channel launched on 24 February 2019, replacing the BBC Two Scotland regional variation of BBC Two. For children aged six and above. HDFor children aged six and above. 7th November 2018. Copy of 10729 V (Channel 4+1, E4+1, More4, Film4+1). Channel 4's cultural channel offering dramas and documentaries. HDTelevision channel launched on 24 February 2019, replacing the BBC Two Scotland regional variation of BBC Two. HDCultural television channel by the BBC. 25th October 2017. New transponder. Shia Islamic religious television channel. Sunni islamic television channel from London. News television channel from Pakistan. Founded and owned by Mian Amer Mahmood. Islamic religious television channel from London. Ahmadiyya islamic television channel from UK. Programs mainly in Urdu. Several programs in other languages such as English, Arabic, Bengali, Indonesian, French, Swahili and Hausa. Catholic channel broadcasting from Alabama. 27st January 2018. FEC change from 2/3 to 5/6. British digital television channel, focusing on crime drama. Channel specialised in horror films and series. Cult, Hollywood, comedy, B movie classics, modern thrillers. Formerly called CBS Action (2009-2018). Replaced Zone Thriller (2009). HDInternational English language news television channel owned by Government of France. Pakistani news and entertainment television channel. English language international news television channel. Pakistan Television Network International public television channel. Islamic religious television channel run by Dawat-e-Islami (Sunni Islam organization based in Pakistan). New parameters since 1st March 2017. Now DVB-S2 8PSK 23000 2/3 (modulation, SR and FEC). Before DVB-S QPSK 22000 5/6. Bengali language digital satellite television channel. From Dhaka, Bangladesh. Transmitted throughout South Asia, the Middle-East, Europe, and North America. News, dramas, movies, talk shows. UK-based satellite television channel, established by the British Bangladeshis. Shia Muslim television channel founded by Hassan Raza Ghadeeri (ayatollah of Pakistan), based in United Kingdom. Free-to-air Sky Channel 836. Pakistani entertainment television channel based in Karachi. European version of the channel. Pakistani television channel from UK. Pakistani entertainment television channel from UK. Entertainment channel of GEO network. Indian English-language news channel by NDTV. New Delhi Television Limited (NDTV). Evangelical Christian religious television channel. Based in Plymouth (England), Kansas City (USA) and Jerusalem (Israel). Indian Hindi-language news television channel by ABP Group . Formerly STAR News. Islamic television channel from London. HDInternational English language news television channel. New parameters since 30 October 2017. Now DVB-S2 8PSK 23000 2/3 (modulation, SR and FEC). Before DVB-S QPSK 22000 5/6. HDInternational English language business news television channel. Old game shows from the UK. 22th January 2019. SR, FEC and modulation change from 29500 8/9 DVB-S2 QPSK à 27500 2/3 DVB-S2 8PSK. 30th July 2018. SR, FEC and modulation chnange from 27500 5/6 DVB-S to 29500 8/9 DVB-S2 QPSK. 8th January 2019. SR, FEC and modulation change from 29500 8/9 DVB-S2 QPSK à 27500 2/3 DVB-S2 8PSK. 20th March 2019. TP reactivation with new modulation and FEC. For instance, satellite Astra 2E. 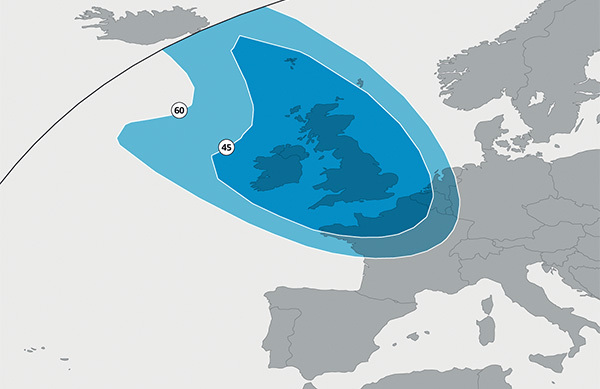 The official coverage map for Europe beam is (important remark: considered only up to 120cm diameter satellite dish). 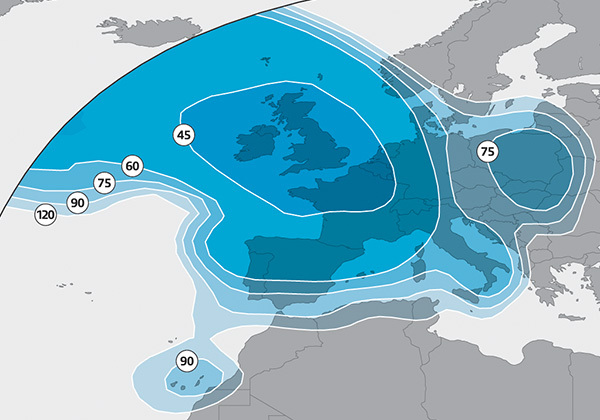 The official coverage map for UK Spotbeam of Astra 2E, Astra 2F and Astra G (important remark: considered only up to 60cm diameter satellite dish). I am from Nigeria. How can I hook up with Sport channels on Astra 2E? If your satellite dish is aligned to satellite Eutelsat Hot Bird 13º East, you watch channels that are available via that satellite. If you want to watch channels on satellite Astra 2 28.2º East, you need to align your dish to satellite Astra 2 28.2º East, and perhaps a larger dish. BBC One is available in middle east? Hello, please will it be possible to receive FTA Documentaries and BBC One Beams to Kenya, East Africa. Kindly advice SR, satellites etc. I live in south of Sweden but since a few days many channels like Movies4men, BET, Pick are not longer available. I have tried to make a new search with the receiver but nothing. Have there been a change to the UK beam? Thanks. Good Site best then lying sat Sir could u pls tell me could we set any size dish for east/28.2/e in pakistan, faisalabad. Do you have a distributer for Digibox in France where i can subscribe in english channels. Have a 1.0 mtr dish in Moliets 40660 We lose the spotbeam in hot weather. The dish is pointing over the forest and also in bad weather. I think the heat rising from the forest effects our signal. I was wondering if astra 28.2E is receiveble in riyadh, saudi arabia. I know the satellite is closer than hotbird towards saudi arabia. What size dish do I need? I just want to watch uk channels here in Saudi Arabia like e4, itvBe, and food network. Many thanks. Where is the listing for the Irish channels on 9E, RTE's? Guess this is not a complete list of satellites. • Since 1st August 2017 SONY SAB, B4U Music, Zing and &TV are encrypted. • Since 18th August 2017 Colors, Colors HD, Rishtey, Rishtey Cineplex and News18 India are encrypted too. Go to bobbles.tv. You can watch excrypted channels like colors, rishtey and other channels without any streaming issues. They provide live content and 7-day catch-up tv, so you can always stay up to date. Which channels are available in Astra 2E Middle East beam? I am in East of Turkey and interested in watching Astra 2E Channels. I'm a Nigerian what size of satlite dish do i need to hug up Astra 2e,2f, & Astra g UK sport beams, secondly Astra 2e Europe beams? You can't receive them in Nigeria. You can't receive UK / Europe beams listed above in Iran, only Middle East Ku-band beam not listed here. 7th November 2018 New TP 10936 V 22000 5/6 copy of 10729 V (Channel 4+1, E4+1, More4, Film4+1). "no line available" or "no signal available"? What are the brand and model of your decoder? If you can't set FEC manually, decoder detects it automatically. Szia! Egy olyan kérdésem lenne,hogy Magyarország területéről azon belül is Zagyvaszántóról miért nem tudom a 80 Cm es antennámat az Astra2 műholdra beállítani? Az Astra1 és a Hot Bird tökéletesen jön a fent említett antennámmal de az Astra2 őt lehetetlen beállítani erre a műholdra.A Travel Channelt szeretném nézni de sajnos nem tudom.Hogyan állítsam be hogy működjön is. In Düsseldorf Astra 2 Europe Beam and Astra 2 UK Spotbeam are stronger than in Hamburg. Perhaps you need 2 meter to receive all Astra 2 transponders in Hamburg. Szia Webmaster! Egy olyan kérdésem lenne,hogy az Astra2 Műholdat milyen méretű antennával lehet elérni Magyarországról? Mert volt olyan aki azt mondta elég hozzá egy 80 cm es. Argeles Sur Mer, France(20k SE of Perpignan) UK Spot beams (SD channels)just receivable (no margin & frequent dropouts)on precisely aligned Triax TD110 (1 metre offset dish) + Technomate 5402 mk3 receiver.